Happy Easter all – that is, if you celebrate it! If not, Happy Sunday! 😀 I hope you all have had a relaxing weekend – to be honest, it’s been crazy here. 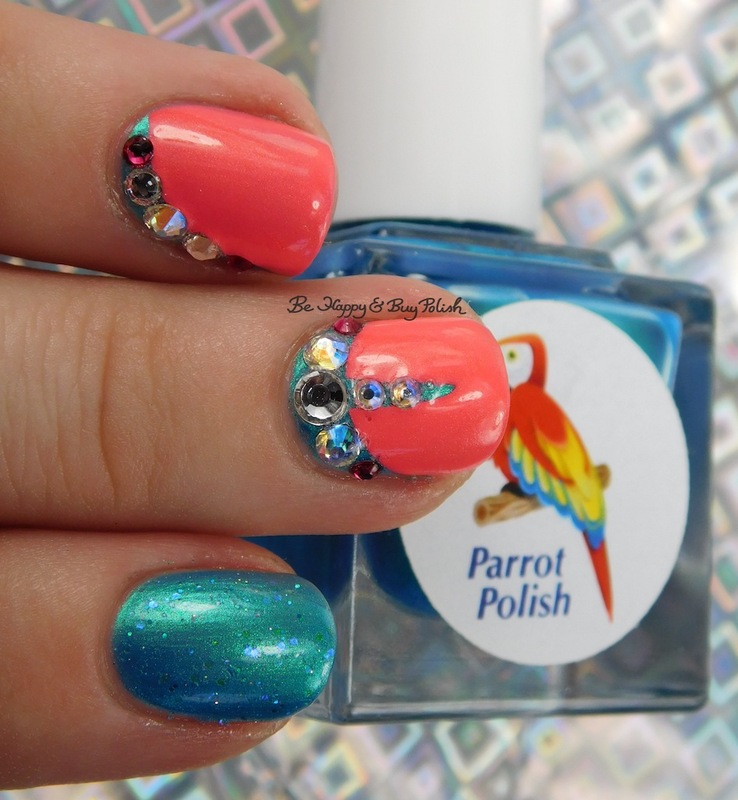 But I really quickly want to show you my manicure today with Parrot Polish Blue Macaw, China Glaze Bite Me, KBShimmer Salt Water Sassy, and CrowsToes Nail Color Sweet as Sugar…Cold As Ice. I’ve also used nail gems from Crystal Parade. I started with 2 coats of Blue Macaw on my fingers. Formula is a bit thin, and it does dry a bit brush-strokey. I used China Glaze Bite Me on my middle and ring fingers, leaving space for nail gems. These nail gems from Crystal Parade are quite fantastic! I’ve never had any trouble getting them to adhere to the nail. I’ve just been using nail polish to get them to stick and they’ve been lasting until I’m ready to take off my mani! On my thumbs, I’ve used 3 thin coats of KBShimmer Salt Water Sassy. It’s a bit thin, and it definitely needs top coat as the glitters slightly stick up a bit when it’s dry. 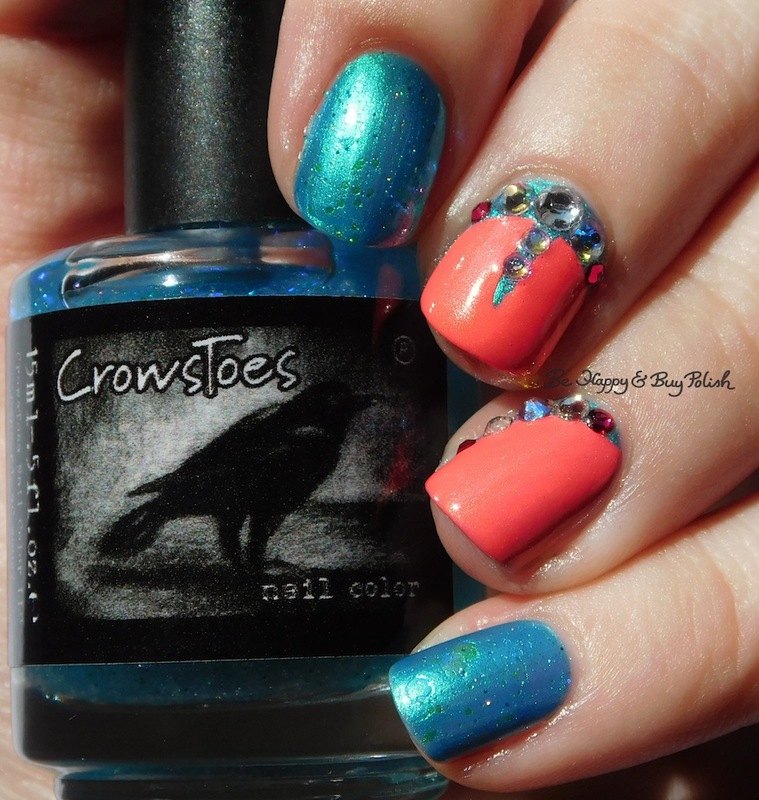 Lastly, I used 1 coat of CrowsToes Nail Color Sweet as Sugar…Cold as Ice over Blue Macaw and Salt Water Sassy. This added a bit extra oomph to those nails. I really love how this mani turned out – it goes well with my Easter dress! Anyway, I hope you have a wonderful weekend, full of rest & relaxation (and not too much laundry if that’s your thing on weekends like it is for me!). I like the design you created using those embellishments. These are so fun! Love the color combo! Happy Easter! 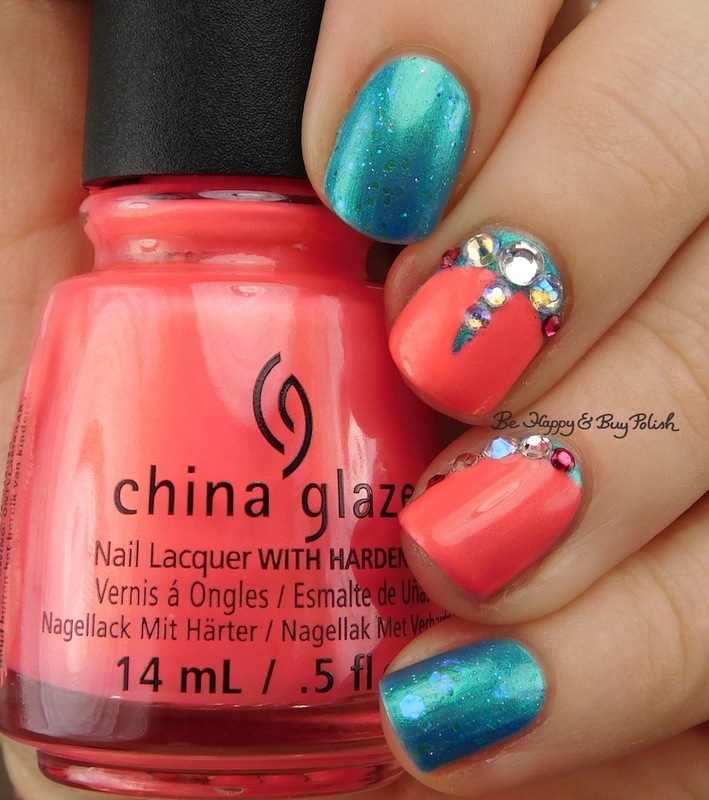 Those rhinestones are so pretty!